I recently came acoss the two bobbins. The center hole is "extremely" large when compared to my other bobbins. an anyone give me any info. I cannot find any markings. I think the one on the left with the cardboard would be a prewound embroidery bobbin. I haven't seen such a large hole before. Cardboard? One of them has cardboard? 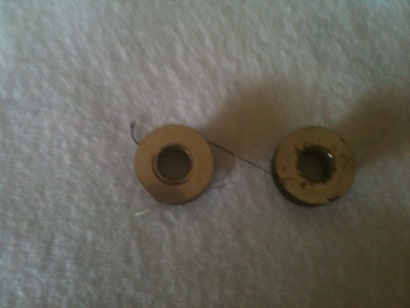 Those are the bobbins that fit my old Montgomery Ward Supreme Reversible Rotary...it was made by National in approx. 1949. Very interesting. When looking at them I thought they might be for a vintage or antique machine.